Options: Step OnlyWith 4'x5' Step Pad (+ $70) This item is out of temporarily out of stock. Contact us for shipping date. 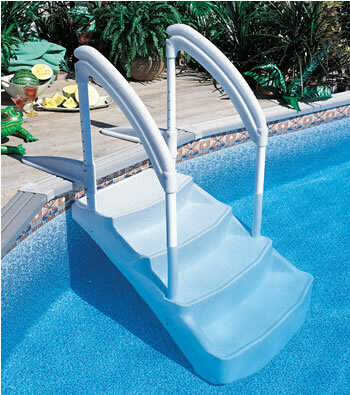 This model has been discontinued, but we have other Aboveground Pool Steps and ladders in stock. A BEAUTIFUL NEW DESIGN IN ABOVEGROUND STEPS AT A GREAT PRICE! The Royal Entrance features a clean, beautiful look in an easy-to-install design. The Royal Entrance has skid-resistant steps for sure-footed use and will fit either a 48” or 52” deep pool. New side barriers prevent children from becoming trapped underneath the step and make it compliant with all safety codes. Durable polymer handles make getting into and out of the pool a snap for the young and the old. We offer an optional 4'x5' protective pad. For pools without decks, add the available ladder attachment kit. The Royal Entrance can hold up to 350 lbs. and measures 43” high x 34” wide x 42” deep. 1-Year Warranty. Ships via truckline. For the ladder assembly and installation instructions, click here.